Safe, one touch operation. 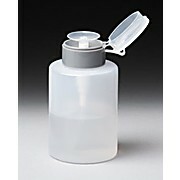 Perfect for alcohol dispensing on cotton balls, swabs, brushes. Convenient swing lid, reduces odors, maintains purity. Large opening for easy filling.